Passengers (2016) has stayed with me more than I expected; beneath the glossy production design, and a love story between the two attractive leads, something much darker is struggling to receive its due. Plot spoilers ahead; consider yourself warned. The setup is as follows: The starship Avalon is 30 years into a 120 year voyage between Earth and a colony planet in another star system. It carries five thousand settlers, all meant to stay in suspended animation for the duration of the voyage. A chance impact from an asteroid causes a malfunction, and a mechanic named Jim Preston (Chris Pratt) is awakened 90 years early. Jim can't go back to sleep, can't contact Earth without waiting 60 years for a reply, and won't live to see the end of the voyage. He has no company except for a robot bartender named Arthur (Michael Sheen). Arthur can pour drinks and make small talk, but is not sentient; like the computer program Eliza, he tends to reflect back whatever is being said to him. We watch as Jim comes to understand his situation. The ship has luxurious passenger accommodations, so he can live in comfort; but over time, the isolation takes its toll. If anything, the film downplays the horror of Jim's predicament. Human beings are not mentally equipped to handle this type of isolation. Prisoners in solitary confinement suffer paranoia and hallucinations, and they are far less alone than Jim is. Over the course of the next year, he deteriorates until he is close to suicide. Then he develops an obsession with one of the sleeping passengers, a writer named Aurora (Jennifer Lawrence). He reads her work, and finds it appealing. He knows he can wake her up, and after agonising for many weeks, he does so. Like him, she is now doomed to spend the rest of her life on the starship, never reaching its destination. This is a monstrous, possibly unforgivable act, and Jim knows it. Aurora, on the other hand, starts off completely innocent. Jim tells her she awakened spontaneously like he did, and she has no reason to disbelieve him. First friendship and then romance blossom between our two leads; then Aurora finds out what Jim did, with dire consequences for their relationship. This film could have been played as an unsettling psychological horror, something like Kubrick's The Shining. Indeed, the cavernous bar where Arthur plies his trade could have come straight out of the Overlook Hotel. Instead, I'm thinking of AI: Artifical Intelligence, which was started by Kubrick before his death and then completed by Steven Spielberg. AI has an odd clash between Kubrick's coldness and Spielberg's sentimentality, and so it is with Passengers. The early relationship between Aurora and Jim is shown in the style of a charming love story, helped along by good chemistry between the attractive and likable actors. The audience and Jim, but not Aurora, are aware of the disturbing background. This seems to have been a stumbling block for many reviewers. Passengers has very much divided critics and public, who respectively give it 31% and 68% approval on Rotten Tomatoes. The critics may have been led astray by promotional material, which from what I understand played up the romance and didn't mention the creepiness. I think I was fortunate going into this film without knowing much about it. In fairness, the film does allow Aurora to discover what happened, and her reaction is what one would expect: Shock, disgust, a feeling of violation, and her growing love for Jim flipping at once to a equally intense hatred. In the third act, it turns out the impact which awakened Jim damaged some other vital systems. The entire ship is in danger, and the two protagonists are forced to work together to survive. Jim shows great courage and resourcefulness, which somewhat redeems him in Aurora's eyes. It's handled in a clunkingly obvious way. At one point, Aurora pleads with Jim not to risk his life. I can see what the filmmakers are aiming for, but it didn't quite sit right with me. Jim is indeed being brave, but he's doing it to save his own skin as well as Aurora's. If he doesn't follow his risky plan to save the ship, they will both die. He's being heroic, but not selfless, so it doesn't balance the profound selfishness of his decision to revive Aurora. The film does rescue its plot at the last minute, with something of a deus ex machina. It turns out there is one, and only one, sleep pod hidden away. Aurora can go back to sleep and wake up in ninety years as planned, while Jim lives out his life alone. Given a free choice, she decides to forgive Jim and stay with him. It's a little doubtful whether this is in character for her, but Lawrence is a talented enough actor to pull it off, and so our film has a happy ending. Another point of comparison is the BBC sci-fi comedy series Red Dwarf. It had a remarkably similar premise, with the last human being alive wandering around in a massive spaceship, three million years away from Earth. If Lister was less of a slob, and had Kochanski instead of Rimmer as a companion, the resemblance would have been even closer. Last but not least, I have to mention some gobsmackingly blatant abuse of science. It would be silly to expect rigorous accuracy from a film like this. I can put up with an almost unlimited amount of hand-waving and pretend physics, as long as it makes sense within the fictional universe; but one scene severely drops the ball. Aurora is swimming when the ship's artificial gravity fails, and for some reason the contents of the pool float into the air. Okay, fine. But wait! Aurora is trapped! She can't swim to the edge of her blob of water, and she is about to drown! Will the gravity come back in time for her to escape? Holy smeg, that's dumb. Gravity or no gravity, she can still push against the water, in a process known as swimming. Newton's second law of motion works just fine in zero gravity. Why can't Aurora swim out? Who knows? The whole thing is just an excuse for some nifty special effects, and putting our heroine in peril while she happens to be wearing a swimsuit. 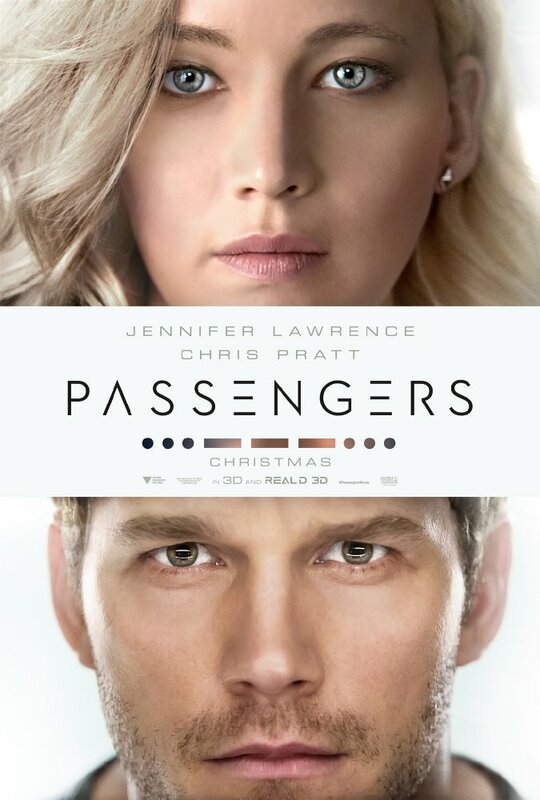 Despite such episodes of stupidity, and the uncertain handling of the film's central conflict, I found myself enjoying Passengers quite a lot. Much like Jim himself, this is a film with its share of flaws and weaknesses, but it just about manages to get away with it.